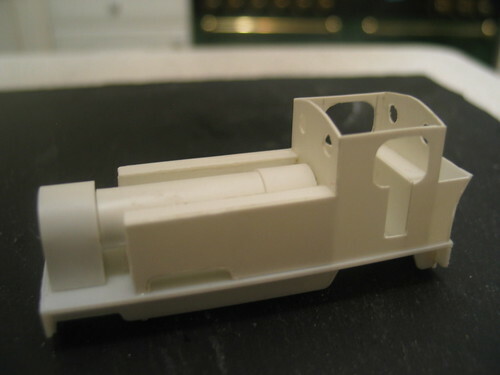 Over the last couple of weeks I’ve been working on a plasticard prototype of the Parlakimidi Light Railway PL class loco kit planned by Invercloy Loco Works. I offered to help out visualise what this engine was going to look like at 009 scale because, shorn of its colonial details, it ought to be appropriate motive power for the kind of railway I envisage the Fairlight project to be. And indeed it is. The prototype class was an outside-framed 0-6-4T built initially in 1925 by Kerr, Stuart and later by Hunslet and at 4mm scale it makes a pleasingly chunky engine with a very English shape. Tom at Invercloy Loco Works is currently deciding on the best medium to produce the kit in – it’s likely to be either an etched brass or cast resin body. The choice of chassis that will make the thing work is also yet to be finalised – early thinking was to use the new Dapol Prairie mechanism, another option could be a custom outside-framed brass chassis that would add complexity and cost to the kit, but following the announcement of the N-Drive Productions 009 chassis at Narrow Gauge Midlands another – perhaps ideal – option has suddenly presented itself. This will all be cleared up in time, but I think it’s safe to say that Fairlight will become home to a “fully restored” PL class in the hopefully not too distant future. Once the prototype’s work as a photographic model and demo body is done I think I will paint and weather it to represent a loco in need of some tender attention and have it lurk behind Fairlight’s engine shed. Check out the Invercloy Loco Works site for more details on the loco, kit progress and links to further prototype photos. This entry was posted in hunslet, indian, model railways, narrow gauge, PL class, scratchbuilt. Bookmark the permalink.